Tune an ear to the going ons of the gaming world, and you might hear two things. 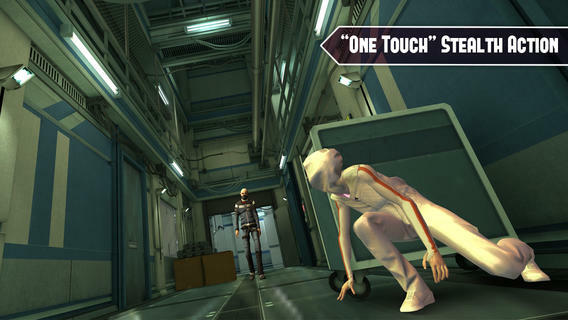 A drop in half-thought jokes aimed at mobile gaming, and a buzz surrounding “Republique.” The two are most certainly related. In “Republique” you play an unspecified person assisting a young girl named Hope as she attempts to escape from the prison fortress of totalitarian over-rulers. The first part of a five part episodic series, going into any more details regarding the plot of “Republique” would not only be an inadequate effort, but would certainly ruin what is even in this extremely early going a simply gripping tale of intrigue and discovery. Now, as Hope is devoid of any particular special abilities outside of some quick wits, a talent for hacking, and some basic thieving skills, “Republique” is very much a stealth game. That’s a genre you don’t see often in mobile gaming, for the simple reason that it’s a tricky proposition with touch controls. “Republique’s” solution to this problem is to keep things simple. Nearly every action is completed through a single touch. That could have been the kiss of death for the title, but its executed in such a way that you always feel like you’re in control of the situation and the challenge only derives from the areas of the game it is supposed to. In fact, I’d go so far as to say this is among the most enjoyable stealth gameplay experiences to come along since the heyday of the “Thief” series. It may not reach the lofty heights of that classic franchise, but to even be judged by that measuring stick it set should tell you a lot. As good as the game is moment to moment, though, its true value lies in its production value. While this is immediately apparent when viewing the game’s graphics, an even great love has gone into the game’s voice acting (which incredibly includes “Metal Gear Solid’s” David Hayter), writing, and scripting. The combination of these three ensure that memorable characters, moments, and dialog appear with ease and make “Republique” something of an anomaly on the mobile scene, as a game that matches (and at times exceeds) the level of production quality you get from a AAA major game release. Again that doesn’t just apply to the graphics. We’ve seen mobile graphics of higher caliber before. “Republique” is a game that feels like big budget release from top to bottom. That’s the goal that developer Camouflaj promised when they put “Republique” on Kickstarter and even though the series is far from over, it’s a goal they have already fulfilled in some measure with this first installment. It’s easy to get spoiled with not only the increasing quality of mobile games, but how incredibly cheap and plentiful they are in comparison to say full fledged handheld titles that you’d find on the 3DS or PSP. “Republique” is the type of game that immediately alerts you to how spoiled we’ve become with the concept, as it provides a gaming experience you can’t find anywhere else on your phone or tablet of all places. If you want a great mobile pick up and play game that you can turn on, enjoy, and shut down with relative ease, then pick up “Ridiculous Fishing” or any number of great arcade like apps. However, if it’s a taught thriller as gripping as any Hollywood espionage tale, and as immersive as any great stealth title in gaming’s past your after, then there is no legitimate competitor to “Republique.” It’s a landmark release, and my app of the week.